Commercial pet food is not always easily digested, and many dogs and cats lack the essential digestive enzymes that allow them to get the full nutritional benefit of their food. If your dog or cat suffers from loose stools, diarrhea, gas, constipation, poor skin or hair condition, or lack of energy, it’s likely he’s not properly digesting his food. EcoDigestive™ Probiotic & Enzyme Support Formula improves your pet’s digestion and the absorption of nutrients in his diet. And of course, our 100% Satisfaction Guarantee – or your money back! EcoDigestive Probiotic & Enzyme Support Formula improves your dog or cat’s digestion and promotes healthy gut bacteria. Probiotics are “good” bacteria that are necessary for optimal gastrointestinal health. Over 15 digestive enzyme strains ike Bromelain, Protease, Peptidase, Amylase, and L. Acidophilus help increase nutrient absorption, promote metabolic energy production, and reduce toxin build-up and inflammation in the body. Our high-quality, all-natural ingredients allow your dog or cat to get the maximum benefit of the essential nutrients and vitamins in his food and replenishes balance to his digestive system. EcoDigestive works with your pet’s body to restore healthy levels of good gut bacteria and digestive enzymes, helping bring about true gastrointestinal relief and healing. Regardless of what you feed your dog or cat, EcoDigestive will help to digest food, absorb nutrients, regulate metabolism, and support normal immune response. Our easy-to-use concentrated powder formula can be easily incorporated into your pet’s normal food routine. EcoDigestive also supports good breath and body smell, promotes healthy skin and coat, resistance to illness, and maintenance of healthy body weight. We believe every pet can benefit by adding probiotics and enzymes to their diets, restoring their body's natural ability to absorb essential vitamins and minerals and experience an active, vibrant quality of life. Try EcoDigestive today to give your pet the digestive health support they deserve. NOTE: EcoDigestive should only be used on pets 12 weeks and older - we do not recommend this product for puppies/kitties younger than 12 weeks. Order EcoDigestive today, and we’ll have your package wrapped up and on its way! 100% natural or naturally derived ingredients that allow your dog or cat to digest his food efficiently and to support optimal nutrient absorption. No artificial chemicals, hormones, steroids, preservatives, or antibiotics. Dry formula is easily added to your pet’s food. Works for both dogs and cats. Helps to reduce digestive upset, undesirable gas, bloating and related discomfort. EcoDigestive Formula contains only natural and naturally derived ingredients, which means that your pet is not ingesting any harmful chemicals and artificial preservatives. Our concentrated formula is quickly absorbed. Daily application helps give your pet better digestion, nutrient absorption, and immune function. Simply add half a scoop per 10 pounds of body weight to your pet’s food each day. Our proprietary formula contains over 15 essential digestive enzymes to aid your pet’s digestion. Our naturally based ingredients have been carefully selected and dosed for their ability to help break down your pet’s diet, including both carnivore diets and modern food elements. As with all Vet Organics products, we offer a no-risk guarantee. Just try a product as directed and if you’re not happy for any reason, we’ll refund your money. This custom probiotic blend helps maintain a healthy and balanced digestive tract and aids in nutrient absorption. Our blend contains optimized amounts per dose based on your pet’s weight. A custom blend of healthy gut bacteria promotes digestive health and helps restore your pet’s natural balance of good bacteria in the digestive system. Our custom blend of digestive enzymes helps break down food, fight inflammation, and improve digestion. Specially formulated to provide optimal levels for your pet. An anti-inflammatory agent from the pineapple plant that digests proteins, promotes plasmin, and contributes to healthy tissue. An antibacterial, antifungal, and antiviral protein enzyme that also possesses antioxidant and anti-inflammatory properties. Stimulates white blood cell counts and helps fight infection in the digestive tract. Not only is it packed with nutrients like copper, iron, niacin, phosphorus, and zinc, it also tastes yummy! A chemically inert, food-grade material used to maintain consistency. Measure 1/2 scoop of EcoDigestive Support Formula for every 10 lbs. of your pet’s body weight. Apply directly to food once per day. Note: While your pet’s digestive system adjusts to the enzymes, his body may go through an adjustment phase. If you notice undesired changes in your pet’s elimination or appetite, we recommend introducing EcoDigestive Support slowly during this adjustment period. Starting with a 1/4 serving, gradually work up to a full serving over a 4-week period. I made a mistake with my address/name but realized too late. No problem, just send us an email using our contact us form with your order number as soon as possible. We try to process orders as soon as we get them so the earlier you let us know, the faster we can correct it before it’s shipped! My transaction was declined but I see charges on my credit card! The charges you see on your credit card are holds that are automatically placed by ​your credit card. These holds should say “pending” on your credit card and will be removed after 72 hours. Unfortunately, we cannot change this as it is part of ​your credit card automated system. Each declined transaction will result in 1 additional hold placed on your credit card. My Credit Card was declined! What should I do? Make sure your credit card details are entered correctly. Your billing address must match the billing address with your credit card issuer. Can I buy Vet Organics products at wholesale? Yes, we allow reputable vendors, groomers, and veterinarian practices to purchase our products for retail sale directly to their customers. Please head to our Wholesale Inquiries page to get more information. Can I buy Vet Organics products in stores? While EcoEars can’t be bought at major pet retailer chains, we do allow approved, reputable businesses such as veterinarians and others to purchase wholesale as a service for their clients. If you’d like to ask your vet, groomer, or another specialty pet service provider to carry our products, please send them a link to our Wholesale Inquiries page. Where can I buy EcoEars? You can buy EcoEars safely and securely here on our website or by phone, as well as on Amazon.com (those who have Amazon Prime may prefer to buy there). If you’d to ask your family vet or groomer to carry our products, please refer them to our Wholesale Inquiries page. Vet Organics is a pet-focused e-commerce company, founded on the principles that the same way people need natural products, pets need them too. Our products are made in South Florida under strict FDA guidelines called GMPs (Good Manufacturing Practices). Our facilities are registered with the FDA (Food and Drug Administration), and the FDA inspects our facility regularly for compliance. As the FDA’s quality-control process, GMPs ensure that products are consistently produced and controlled according to strict quality standards. Will this work on my pet? And for EcoEars for Cats reviews click here. 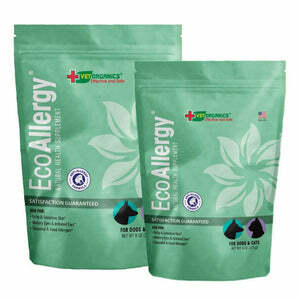 For EcoEars and EcoMange products, one bottle will last long enough for 1-2 treatment cycles for all but the largest dogs or cats. EcoBalance supplements are based on 118 doses per cat or 25 pound dog. If your pet is bigger, give him 1 pump per 25 pounds of body weight. All Vet Organics products go out the door with a minimum 18-24 months shelf life if kept in a cool, dry place and away from direct sunlight. We do not have product samples, but we do offer a 100% money back guarantee so you can get a refund if you’re not happy. How Long is My 100% Satisfaction Money Back Guarantee? Vet Organics guarantees all of our products 100%. Your 100% guarantee is good for one year from the date of purchase. You will never see a guarantee like this on prescription, mass-produced, pharmaceutical & antibiotic products. Will Your Dog Products Work on My Cat and Vice Versa? Can I Purchase Your Product Over The Phone? We strongly urge you to consider purchasing our products online using your credit or debit card. The online purchase process is safe and our website automatically encrypts all data from your computer so no one can read it, including us. However, if you do not want to enter your credit card number online under any circumstance, please call us at 800-589-2335 or 561-206-4476 and we will be happy to help you by telephone. Our shipping guarantee is that all orders received before 3 pm EST on a business day will ship the following business day, however in practice 90% of orders received on business days before 3 pm EST ship the same day. We ship from East Coast and West Coast locations, and your order will be sent from the location closest to you. If you choose USPS First Class Mail, we estimate transit time* to be 2-6 business days. If you choose our expedited option, and your order is placed before 3 pm local time, estimated delivery time is 2-3 business days. *Shipping transit estimates do not include our processing and package prep time (up to 1 business day but it is often the same day). You will receive an email confirmation from us shortly after you place your order, and will receive a separate email with tracking information within 1 business day. I live in South Florida. Can I Pick It Up at Your Warehouse? Your order will ship automatically from one of our two warehouses shortly after your order is placed. Orders to South Florida usually arrive in 2-4 business days using USPS First Class Mail and 2 business days using Expedited delivery. We accept Visa, Mastercard, Discover and American Express. We also offer other payment options such as E-checks through PayPal. What is PayPal and can I use my PayPal account to check out? PayPal is one of the most widely used internet payment processing platforms. Most people associate PayPal with eBay; however, we offer it as a direct payment option through our shopping cart. In addition to using your PayPal account funds, PayPal also allows you to use your associated bank account or credit card. Once you have added the items to your shopping cart and you are ready to check out, you will see the available payment options. Is My Payment Information Secure with You? Yes, all of our checkout options use the latest encrypted security technologies to protect your information from the moment you enter your shopping cart information. No personal data is ever stored on our local servers. In addition, you can take confidence that our store is a Google Certified eStore. We hate when this happens as much as you do. Please call us at 561-206-4476 and we’ll get you squared away. With the exception of EcoEars for Dogs and EcoEars for Cats, which are currently available in Canada, we do not ship outside of the US at this time. What if I need support after purchasing a product? We love to interact with our customers. Our preferred contact method is by email sent to us at info@www.vet-organics.com, but if you prefer the telephone, please call our hotline at 800-589-2335 or 561-206-4476 and we’ll have the right person call you back. We guarantee that all orders will ship within one business day regardless of shipping option selected. We also have options to obtain free shipping. Please refer to our Shipping Policy page for our complete Shipping Policy. Please see our Returns Policy page for our complete returns policy. I Don’t Use My Credit Cards Online. Can I Still Purchase Your Products? Yes, we can also process credit card orders by telephone or you can send in a check or money order. To place a credit/debit card order by telephone, please either email us your phone number at info@www.vet-organics.com and we will call you back, or call us directly at 561-206-4476. Orders placed with money orders will be shipped within 1 business day. Personal checks will be held until cleared, then shipped. If you have any additional questions or need any help, email us at info@www.vet-organics.com. We are happy to help you. Orders placed with money orders will be shipped within 1 business day. Personal checks will be held until clear, then shipped. If you have any additional questions or need any help, email us at info@www.vet-organics.com. We are happy to help you any way we can!